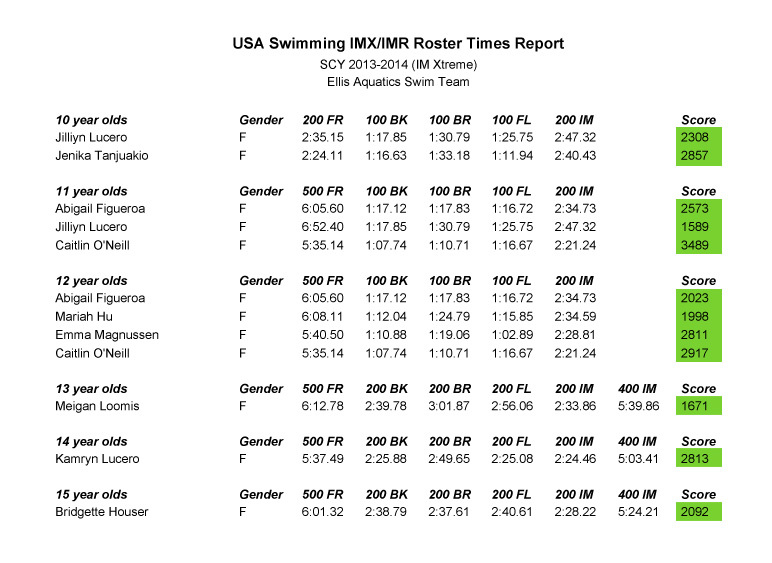 IMX Team Updates - Ellis Aquatics: The USA Swim Club of Tracy. Thank you to all our brave athletes who completed their IMX events at the Tiger Aquatics CBA meet this past weekend in Stockton. We now have 9 swimmers who have completed all of their IMX events! All 9 swimmers scored high enough to qualify for the IMX XTREME Games, a Western Zone Championship Meet held in the Fall each year. Qualifying scores are 1500 points spread out between all 5-6 events. Congratulations to Meigan Loomis, our only 13 year old IMX qualifier! Congratulations to Kamryn Lucero, our only 14 year old IMX qualifier! And congratulations to Bri Houser, our only 15 year old IMX qualifier! We are now 3 points closer to becoming a Level 3 swim club! Full point scores are listed below. As is a list indicating which events you or your athlete are still missing. Qualifying Score for the IMX Championships is 1500 points. Every swimmer who has completed IMX has qualified!